Joining this year’s Davao Agriculture Trade Expo (DATE), the Western Mindanao Agriculture, Aquatic and Natural Resources Research and Development Consortium (WESMAARRDEC) banners one of its most notable exploits for the sardine industry. WESMAARRDEC’s effort and that of its member agencies provide support to the goal of improving the supply chain of sardines in selected regions of the country. The joint effort primarily addresses the decline in sardine’s production, coupled with overfishing which may jeopardize the industry’s numerous beneficiaries not only in the Zamboanga Peninsula but also in the whole country. The industry’s beneficiaries include canning factories, bottled sardine manufactures, fish processors, tin can manufacturers, commercial fishing operators, and dried fish processors. Responding to this concern, the Department of Agriculture (DA) and the Department of Interior and Local Government (DILG) implemented the sardines closed season through a joint administrative circular. It prohibited the catching of sardines in the conservation area (East Sulu Sea, Basilan Strait, and Sibuguey Bay) for three months from December 1 to March 1 for three years (2011-2014). The sardines closed season is a project component of the Sulu-Celebes Sea Sustainable Fisheries Management Project (SCS-SFMP) of the DA-Bureau of Fisheries and Aquatic Resources/National Fisheries Research and Development Institute (DA-BFAR/NFRDI) and funded by the United Nations Development Program (UNDP). To provide science-based information to validate the policy on closed season for sardines, the Philippine Council for Agriculture, Aquatic and Natural Resources Research and Development (PCAARRD) of the Department of Science and Technology (DOST-PCAARRD) funded a program on the development of tools for managing the sardine fisheries. 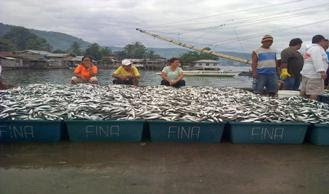 The three-month closed season for sardines resulted to the increase in the production of sardines in the study area. It recorded a 30% increase in sardine production in 2012. There was also an increase in the relative number of spawners, disappearance of small sardines, and appearance of bigger ones in the landed catch. In 2011, PCAARRD, with the support of the UP Marine Science Institute (MSI) and in cooperation with UP Visayas (UPV) and Mindanao State University-Naawan (MSU-Naawan) implemented a program for the development of robust tools for the sardine industry using satellite and landed catch data under its Industry Strategic S&T Program (ISP). DOST-PCAARRD funded five projects under this initiative. The first project ventured on capturing the dynamic linkages between small pelagic and primary production through satellite images and models for better resource management in the Bohol Sea and the Zamboanga Peninsula. The other projects worked on sustaining the sardine fishery industry through a better understanding of the time and space dynamics affecting sardine in the Zamboanga Peninsula and Bohol Sea System, early life stage mortality and recruitment, assessment of the sardine fisheries in Tawi-Tawi waters and molecular technology-based assessment of the sustainability of sardine fisheries. The program is expected to reduce the depletion of the stock and the decline of sardine production in the country inasmuch as it will provide science-based inputs to policy on conservation and management of the sardine fisheries. Consistent with its commitment of providing “science based know-how and tools that enable the agriculture sector to raise productivity to world class standards,” DOST-PCAARRD is also currently supporting sardine supply chain and impact assessment of the closed season for sardine fisheries.